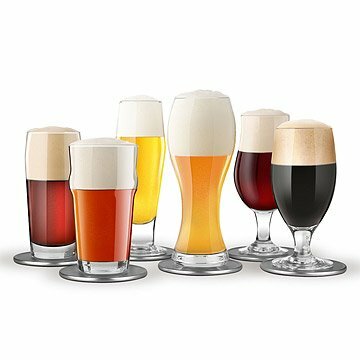 Treat craft beers with the respect they deserve with this set of six tasting glasses. With six types of glassware in various shapes, this beer tasting kit offers the right glass for the right pour. Pilsner, porter/stout, wheat, nonic, stange, and tulip glasses round out the set, while stainless steel cork-backed coasters give your drink the pedestal it deserves. A complete beer tasting guide helps amateurs and aficionados alike profile their drafts while sipping like kings. Made in China. This set includes 6 beer tasting glasses, 6 stainless steel cork backed coasters (3.5" diameter) and 1 beer tasting guide. The glass is very thin and feels cheap. It's not what I expected. I would purchase this for a gift again! The glasses are a wonderful addition to our neighbors home brewing hobby. Husband hasn't used them yet. But the look great! They're a tad smaller than I thought they'd be but I'm sure it'll be fine. It comes with a cheat sheet of pairings so you can pair your beer with the right foods. I bought this gift for my nephew who was turning 30. He brews his own beer and I thought this would be the ideal gift for someone like him. He received them and loved them. I was really excited to gift this to my dad for his recent birthday. He really likes that all of the cups came with cardboard in the same shape of the glass so that he could easily keep all the shapes straight without having to keep the paper together with the glass at all times. Downside: there is no actual beer included for tasting... seems like that would be an easy marketing tactic. This product was small. Was expecting the glass to hold a beer and it barely holds half of one. Not happy.